As you can readily agree, when traveling in a car, your baby’s safety is more important than anything else. That’s why you do all it takes to make sure that your mini-you is as safe as you can perceive, and this involves finding the right car seat for him or her, the right apparel, and so on. And you place him or her in the back seat, either facing forward or backward, depending on his or her age. How do you monitor to ascertain that the child is fine throughout the journey? Especially if you have no other adult company in the car? The fact is that there are countless distractions when you are behind the wheel. And turning back to check on your baby is simply courting disaster. This is where a baby car mirror comes in. It reflects your baby’s image to the front mirror, enabling you to tell what is going on with your baby without the need to turn back. Several reviews of baby car mirrors have been done, but most of these mirrors need to be strapped to the car seat headrest. What if your back seat has no headrest? Or the headrest is circumstantially inaccessible or inappropriate for this task? Luckily, there are types of mirrors specially made to attach to other parts of your car other than the backseat headrest, such as the rear windscreen or the sun shade visor. So, without further ado, lets’ dive into a review of the best baby mirrors for car seats without a headrest. We will give you a step by step process of how to install this type of baby car mirror after the review. But which are the best three of these mirrors? Pnbb is one of the top rated quality baby car mirrors that has been made with your baby’s safety in mind. You can either attach it to your rear windshield or the sun visor clip. Its construction is solid and unbreakable in order to protect your baby from glass fragments that may break from a glass mirror during a car crash. The mirror is made of high-quality polished and reflective acrylic material. To attach to the rear window of your car, it has a suction cup attachment that you can use to stick to the rear windshield. Coming up later is the step by step process of how to install the suction cup. The premium acrylic material is as clear as a glass mirror ensuring that your baby’s image in the mirror is the clearest possible. It has a pivot ball that gives adjustable 360 degrees rotation of the mirror, ensuring that you can view your baby from whatever angle you wish. Unlike glass mirrors, acrylic mirrors do not attract dust and grime and should they get dirty, you just wipe it using a cloth soaked lightly in a non-abrasive cleaning liquid. Ideapro is a universal and adaptable rear facing baby car mirror, perfect for keeping an eye on your baby in the back seat, no matter your type of car or installation surface. It features an explosion-proof reinforced glass membrane and a shatter-proof acrylic surface that will hold the debris in case of a crash, thus protecting baby, mummy or daddy against hurting. It has a wide-angle convex shape and provides 360 degrees rotation and obstruction free rear view visibility. 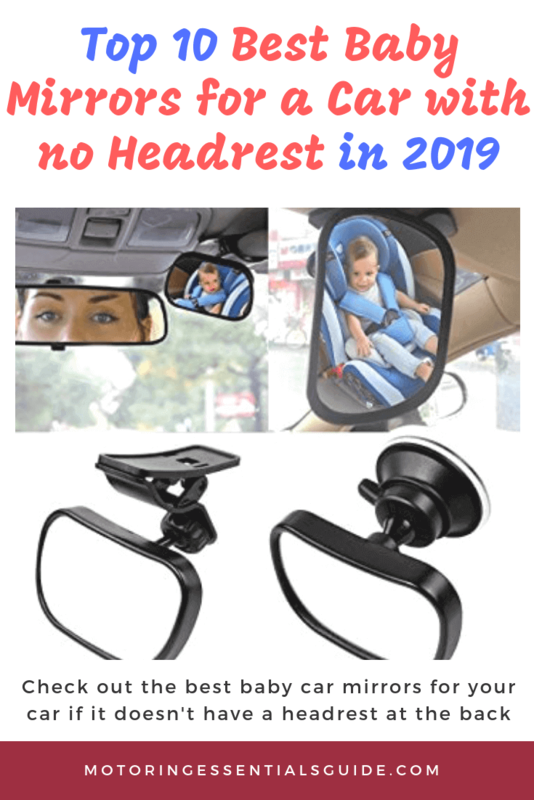 A separate headrest mount provides full angle maneuverability of the mirror allowing full body view of your baby in the rear-facing car seat. Once correctly installed, the mirror does not distort or shift, guaranteeing that you won’t have to halt your car and reattach it. Easy to install whether it’s attaching it to the sun visor or windscreen. Engineered only from the safest and strongest materials, Deezio provides the best in class baby-to-driver viewing without the need to turn and face back while driving. Unlike other run on the mill car mirrors that you well know fall out place every few minutes and need constant readjustment, Deezio’s mount system is so secure that it stays in place no matter the bumps or impact throughout your journey. It has a convex glass that gives you a panoramic and obstruction-free view of your beloved baby in the rear baby car seat. It provides 360-degree rotation, and therefore you can be able to choose different views of your baby until you get the best one for you. It is made of a reinforced explosion-proof glass membrane and a shatterproof acrylic surface, thus guaranteeing you that if it ever breaks, all the fragments will be trapped underneath the surface. A minor hitch is that some people may find the mirror to be tiny yet the reflection is not magnified. However, a larger size mirror (10.2 x 7 Inch) is available. If you are looking for a lightweight and compact yet premium baby car mirror, then Tedgem is for you. It is made of a premium shatter resistant acrylic polymer plastic (PMMA) instead of glass, thus making it more lightweight, compact and safer to use. It provides for 360 degree adjustability, giving you the perfect angle to view your baby in the back seat. It is universally applicable to all types of vehicles and types of back seats, whether yours has a fixed or adjustable headrest or no headrest at all. It provides for two-way installation methods: it can either be attached to the windscreen using the suction cup or clamped on the sun visor. Cara is a high-quality mirror with a simple design that ensures ease of use while guaranteeing safety. Installation is easy and takes only a couple of seconds, by just pulling the suction cup when installing it to the windscreen or clipping it to the car sun visor. It is made of premium quality shatterproof acrylic plastic and not glass, and therefore, it is unbreakable. Once installed correctly, it is very stable and won’t vibrate when the car is in motion. It is adjustable and provides a full view of your baby in the rear facing car seat. CATUO is an awesome baby backseat mirror that gives a perfect resolution such that from the image you might think you are right there with your baby. Your baby sees you back the same way and thus she will get less lonely and cry less. 360 degree adjustability enables you to view your baby from head to toe. This mirror is like a monitor for your baby in the backseat. You just install it in a jiffy and it frees you from any anxiety about your child throughout the journey. It is made of shatter resistant acrylic polymer plastic (PMMA) and not breakable glass. The mirror has been crash tested and is certified for safety in all situations you may find yourself while driving. It is universally applicable to all types of backseats, whether there is a headrest or not. The mirror is small but it provides a wider view and clear reflection. Installation is easy and convenient. You only need to stick the baby car mirror suction cup to the windshield and rotate the switch until you hear a clicking sound. Clipping on the car visor is also equally easy. It has a strong ball joint attachment enabling safe 360 degrees rotation. CIPA is a universal baby car mirror, perfect for dual view, that is, either a rear facing or forward facing child in the car. It comes with two mounting options to accommodate either a rear facing baby or a forward facing toddler. E-bro baby car mirror for backseat is a new kid on the block and it is truly amazing. Most of the positive features of other mirrors have been accentuated to give you superior performance and zero anxiety about your child when you are behind the wheel. The mirror is small (3.5 x 2.2 inches) but it gives a reasonably large reflection and one of the clearest views possible. It is also possible to attain obstruction free visibility. It is made of shatter proof acrylic plastic and not glass. It is easy to fit and provides for both clip and sucker installation methods. Its rear view visibility is obstruction free. How do you install the suction cup and clip baby car seat mirror in your car? For this, you need the mirror, the suction cup with rolling ball, pieces of clean cloth and rubbing alcohol, and non-abrasive lubricant. Clean the windscreen- Clean the windscreen with the piece of cloth wet with alcohol and wipe it dry with another dry piece of cloth. Clean the suction cup- Clean the interior of the suction cup by rubbing alcohol and wipe it dry with a piece of cloth. Grit or dust in the suction cup may create air spaces causing it to pull off the windscreen. Therefore, repeat the cleaning and wiping process until you are satisfied that the surface is clean enough. A suction cup works well when the suction air is lukewarm and the lubricant helps to warm the suction cup. So if it is a chilly day, you need a lubricant that will warm the suction cup and won’t evaporate fast. Wild Birds Unlimited recommends rubbing some skin oil to your face and then rubbing it off your face and unto the suction cup. Lubrication reduces friction thus giving your suction cup a longer life. Lock the suction cup in place- When you are content that the suction cup interior is moist and damp, open the lever and bring the suction cup to the part of the windscreen that you cleaned and press it. Make sure it is firmly in position. While still pressing, close the lever or lock latch back in place. Try to pull it and feel whether it is rigid enough. Ensure that you install the suction cup higher up the windscreen because that way it allows visibility below it and it is easier to tilt it and attain a full view of your lil’ one in the car seat. Fix the mirror and rotate it.-Take the mirror and press its socket on the back onto the rolling ball until it snaps into place. Achieving the desired angle of view- Rotate the mirror to achieve your desired view of your baby. However, this is easier said than done and it will require a lot reiteration to achieve the correct position. This may need you to sit on the driver’s seat as you normally do and check whether the mirror is in a position that provides the desired view. If not, go back to the back seat and repeat the process. An alternative would be to have a helper in the back seat who will keep on adjusting the baby car mirror as you confirm the view at the driver’s seat. This method is mostly used when you have a forward facing toddler. Pull down the sun visor. Press to open the baby car mirror clip and attach it to the sun visor. Ensure that it is firmly fixed. Press the car mirror socket onto the rolling ball until it snaps into position. Adjust the mirror angle to achieve the required view. Safety concerns: do you really need a baby car mirror? Safety concerns have been raised regarding the use of baby car mirrors. Some people claim that these backseat mirrors can become projectiles during a car crash and hit either your child or another passenger. Secondly, some users claim that they distract the driver. Others claim that they reflect other vehicles’ headlights thus becoming a source of background glare. But our countercharge is that all these are short sighted claims. 1. There are so many objects in your car that could become projectiles in the event of an accident, and most of them are looser than the baby car mirror or they are entirely unfastened. These include water bottles, lunch box, toys, and so on. To confirm again, each of the baby car mirrors that we review is shatterproof and crash tested to ensure that it won’t fly off or break into fragments in case of a car crash. And since they are adjustable through 360 degrees, if your baby is in one of the end seats, you can install the mirror in the middle position so that it won’t fly directly into him or her. But of course, you should ensure that you don’t use a baby car mirror with a worn out suction cup or clip. 2. Here is the fact: the anxiety of not knowing whether your baby is choking or sleeping in her car seat is more distracting than the ability to quickly glance into the baby car mirror reflection. The ability to glance into the mirror either puts you at ease or lets you know what action to take if there is a problem. After all, you always glance into the rear view mirrors to check the traffic behind you. In addition, your baby is put at ease when she sees you smiling at her in the mirror. She knows that mummy or daddy is still with her. 3. To avoid the night glare, if your baby is in one of the end seats, install the mirror in the middle position and tilt it away from other vehicles’ headlights. I consider myself a car girl, having grown up messing things at my dad’s auto repair workshop in Springfield, MO. When I was 16 my father bought me a 1981 Isuzu Piazza, through which I first experienced the power of turbo charger and the smooth Lotus inputs. I did my Bachelors at the University of Michigan where I got involved in outdoor activities such as hiking and backpacking in Ann Arbor. After college I worked in the car insurance industry where I got to appreciate the importance of good car parts for safety and claims issues. I later settled down to manage my dad’s garage. In 2016 I combined my 15 years of experience in the automobile industry and launched this site to provide expert advice on car safety, car care, and outdoor stuff. I am also active on social media and you can find me on Pinterest.